s a c e s :: What's this? 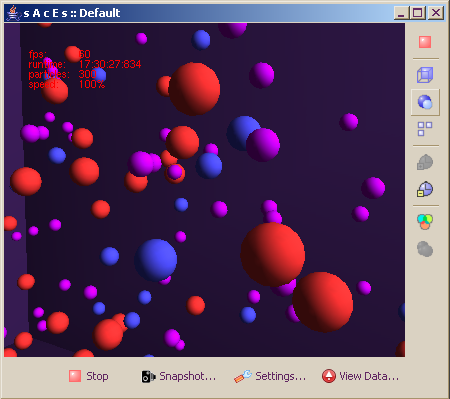 'saces' is a simple tool written in Java which visualizes chemical processes using 3D animation of molecules. It is intended as both an application in artificial chemistry and as an educational tool for students and teachers in chemistry. 'saces' simulates ideal gases in a rectangular reaction vessel. The molecules are hard, colored spheres. An artificial chemistry is a man-made system that is similar to a real chemical system. There is a population of molecules, a set of reaction rules and an algorithm which executes the reactions. With artificial chemistry many applications are possible: artificial life, chemistry modeling, massively parallel execution of finite automata, and modeling how to solve NP-complete problems. See page 97 in the graduates' book 2006 of the Berne Univsersity of Applied Sciences and our diploma (almost 2MB). the old documents from the summer pre-evaluation phase of the diploma.